Only TESLA Tour in Hawaii! Ride with style AND help the environment. Only DanielsHawaii offers private customized tours in a luxury $100,000 Tesla. Explore beautiful beaches, see hawaiian wildlife at turtle beach, taste local food at the North Shore food trucks and make new friends in Hawaii along the way. Free pick you up from your Waikiki Hotel, the harbor or the airport. You set the start time and enjoy our 6 or 8 hour tour on Oahu with a professional driver and guide. The luxury TESLA runs fully electric, has lots of power, helps the environment and is just fun to ride in. DanielsHawaii Tourguides are well trained, can share a lot about the islands and the history - or we can just shut up and drive you wherever you like to go. We customize the tour for your needs. This is a VERY unique experience! DanielsHawaii is the ONLY Tour Company in Hawaii offering TESLA TOURS. Ride in a luxury vehicle AND help the environment. This Private Tour includes the TESLA & the Guide for 6 hours. Our knowledgable Guide can customize this private tour on the fly or we can work out an itinerary before the tour. Whatever you like to do - we make it happen! This ZERO EMISSION Vehicle and our knowledgable driver take you around the island in style. With it's Falcon-Wing Doors you will get everybody's attention at every stop. This 100k Dollar TESLA is not just a beautiful car, it is a statement: Riding in a Luxury Vehicle AND helping the environment is possible! The big windows and the giant sunroof lets you see Hawaii and it's beauty perfectly. Enjoy a smooth ride in this beautiful TESLA on your private tour with up to 5 people. You decide where to stop and how long. On your trip to Oahu you normally want to see most of the Island in a short time. On our Tour you will get an overview over the best Spots on Oahu! Our day trip around the beautiful island of Oahu is interesting, funny and will give you insights that you will not get anywhere else. You want a great souvenir video of your tour? You can buy an individual Video of your tour with Pictures and Clips of you at the best spots on the tour. Just let our driver know! We will stop at the local food trucks on the North Shore to have lunch. Here you can get the best local food. In addition, we will give you some hints where to eat, go out or relax at an uncrowded beach in Waikiki - yes, they exist. 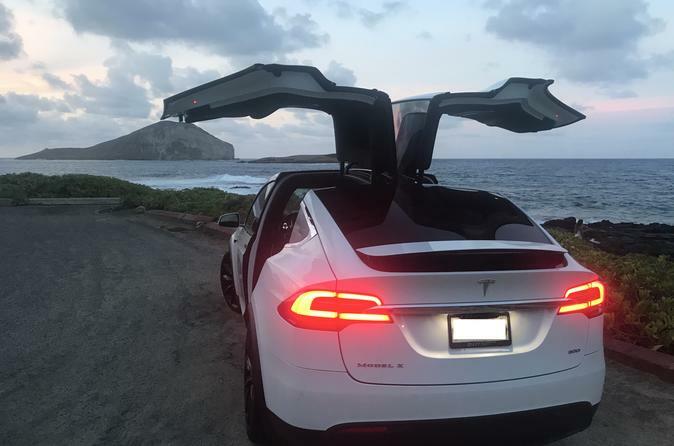 Enjoy this PRIVATE TESLA TOUR ISLAND TOUR with DanielsHawaii.